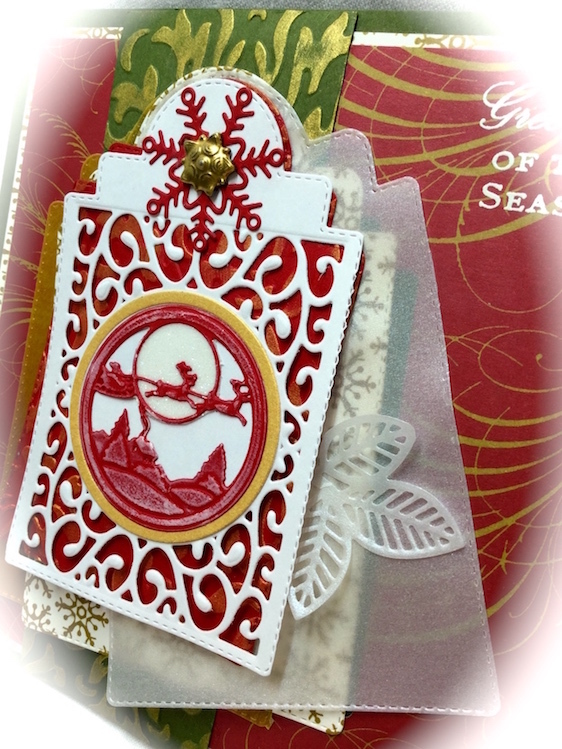 Donna here, with a little Christmas Dies R Us Inspiration today. 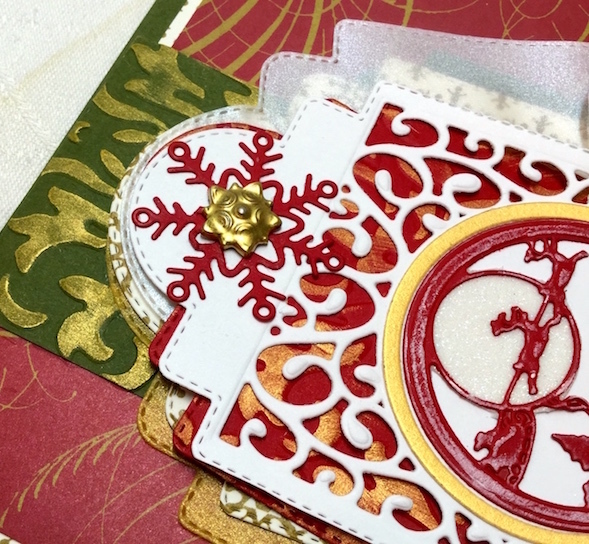 Several layers of the same die cut can achieve texture, richness and color. Use opulent scraps of paper. 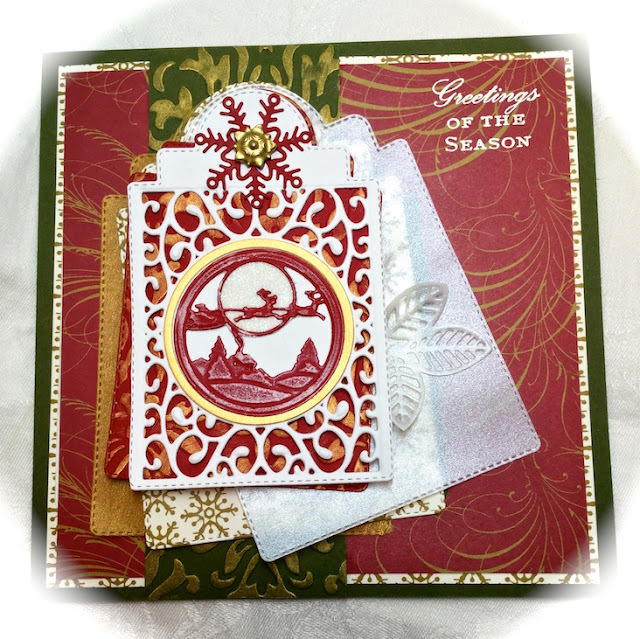 Wet emboss sentiments, background panels, or layer edges. The Pearly Vellum in gold and white lends an unexpected elegance! The heavier pearlescent circular frame is beautifully crisp - it was made by using the round die that came with the Sue Wilson Mini Christmas Scene Background set, and a Spellbinders Classic Circle that was just a tad larger. The intricate brad has been heated and dipped into Detail Gold embossing powder. Non-metallic, true-gold-hue print patterns in the pretty pattern papers sets the stage for the other golds, not taking away from their textures. The gold ink accentuates the dry embossed green panel, and red tag under the white. Hope you enjoyed today's ideas. For more tips about how this card was made, and complete details about the products, tips and techniques, I would love for you to visit my personal blog post. OMG, the details on this beauty is amazing. Love the tips and the gold metallics. Simply stunning. A taste of elegance. Thank you for sharing your outstanding talents. Beautiful tag(s) card Donna! You have used so many differnt techniques and I love the vellum additions! Thank you for sharing such inspiration. Absolutely GORGEOUS Donna! 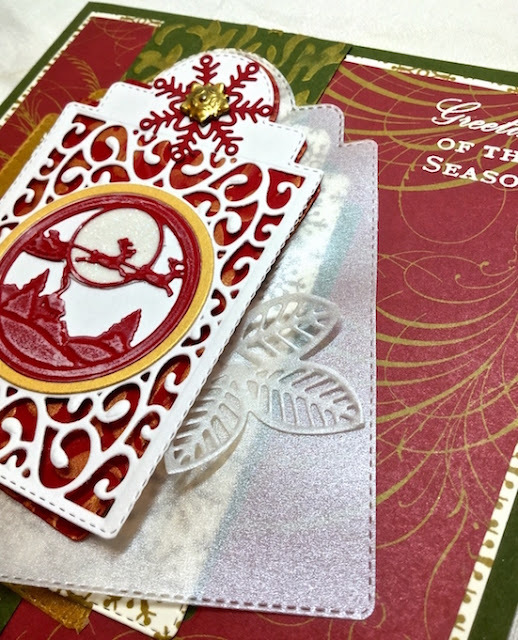 LOVE all the detail and your design is holiday exquisite at it's best! BEAUTIFUL creation and wonderful inspiration! Thanks! Donna, your cards are so exquisite and detail oriented. 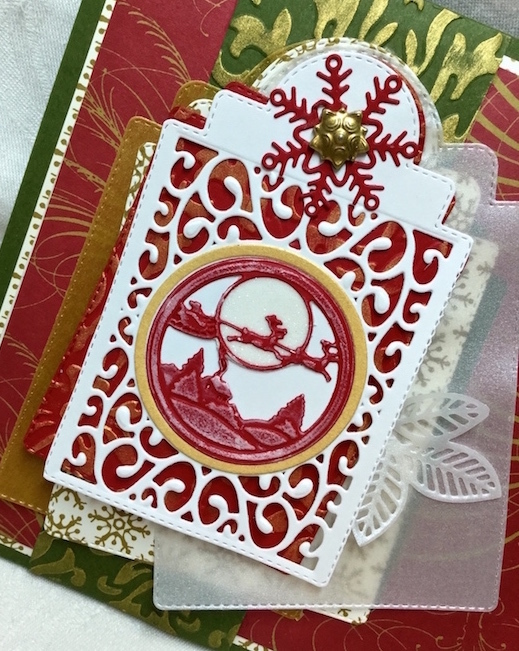 This one is so beautiful with the papers you used, the dies you put together, the layering of the dies, and all the little details you always put into your cards. Love your tip about the glitter too. This is just jaw dropping beautiful! Your work is going to be missed. 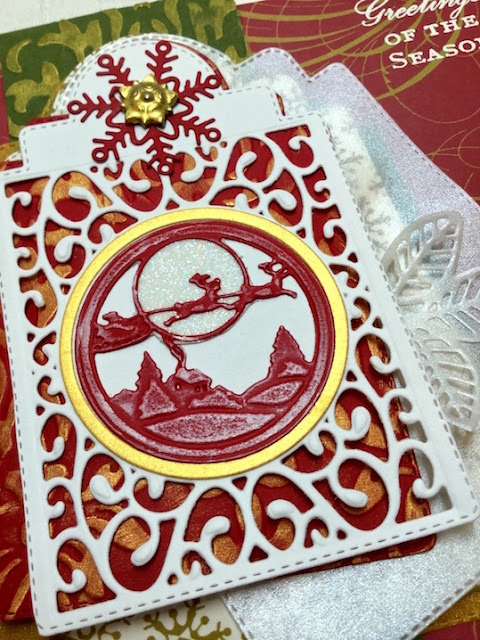 Beautiful layers, such pretty framing of your scene and I love the snowflake under the brad and how you have embossed the brad, wonderful details! Oh Donna, how beautiful this is! So many of your wonderful layers and the gold touches really make this exquisite!